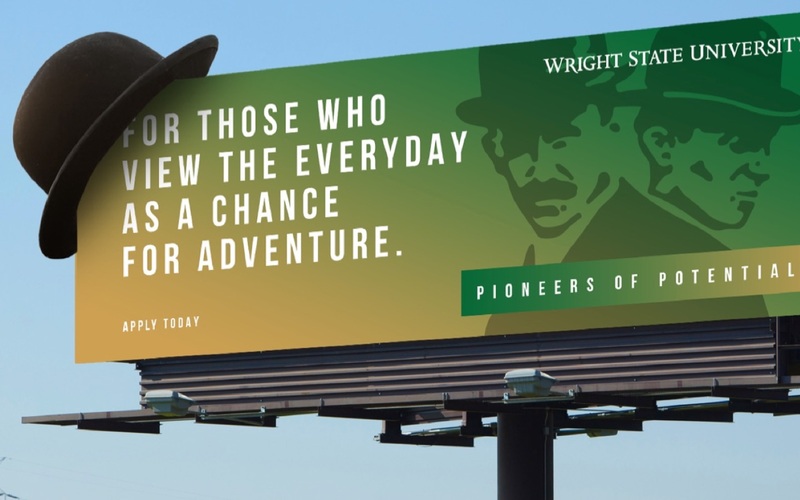 Push | Wright State University's Brand Campaign. As part of the University System of Ohio, Wright State University faced a changing communication landscape along with rapidly decreasing enrollment. A new brand campaign was needed to reconnect not only with its students, faculty and alumni base, but with the entire “Raider” community that it served. Push tapped into emotions: the heritage, legacy and innovation of the Wright brothers—the namesake of the university. Visually, and rather than just relying on the bi-plane that is used in their logo, we utilized the brothers’ iconic bowler hats to showcase students who elevate their own lives and careers. Recognizing that the campaign would live in a digitally native world, we ensured all assets could be used in all channels. Using real students in our campaign photography, we showcased the diversity of university offerings as well as the diversity of Wright State’s students. The TV and online video used spoken word poetry that was modern in its delivery and impactful in its message. For this audience, we understood that not all messaging needed to be focused on scheduled media. By understanding that Gen Z likes to tell their own stories, we created “found” assets around campus that could be personalized, shared and integrated into various social channels. Real-time marketing demands real-time asset creation. We used our content studio to take both created and found elements and weave them together via video, photography and writing to communicate with prospective students using current events, topics and opportunities to connect in a real and meaningful way. Through working with the client to develop enrollment-centric KPIs, we were able to exceed digital lead generation goals. We saw a 333% increase in overall lead flow year-over-year while producing a money-saving CPL drop of 50%. We firmly believe strong creative combined with deep consumer insights and strategic media can push brands to their full potential. Whether you’re looking for an AOR relationship, want support on a project or need a complete rebrand or brand developed, contact Chase Wilson at 407-841-2299.